Both of Jonathan Auxier’s books: The Night Gardener and Peter Nimble and his Fantastic Eyes. Also the legendary The Dark is Rising sequence by Susan Cooper. 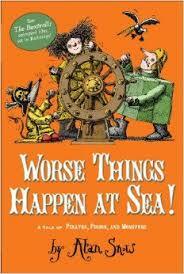 Worse Things Happen at Sea is the follow up to Alan Snow’s Here Be Monsters. Both these books are wonderfully innocent, whimsical reads. Also, and most notably if you’re into the genre, The Monster Blood Tattoo Trilogy by D.M. Cornish. Yes, all these reads are middle grade and YA! Number Three on Amazon for Children’s Superhero Books – And Why My Book is Slightly Pricey!